When walking toward the city center, I pass a little wine shop down the street from me on rue Leyteire that also claims to be a wine club, although I’ve never been by or gone in when anyone else is there except the owner or an employee. That probably has more to do with the hours I keep than with the business they handle. At first, I was disappointed that the young woman who works there during the week speaks English, but she is so nice and helpful that I try and make that the store where I get my wine. The wines they carry are not exclusively from Bordeaux and I’ve liked every one of them. Their prices are affordable. In fact, on the recommendation of the woman, I bought a delicious white wine that has semillon blended in it for 5.90e. Not bad. It’s a cave that’s all heart and dedication to wine. I hope they get more business, because they’re a wonderful part of the neighborhood. Very convenient for the Marché des Capucins, too. Not sure I want to “be the wine” I want to see in the world, in the Gandhian sense, but I’m willing to drink it. Apparently, they have only a Facebook page here. Bordeaux, Week 7: C’est Bio! I didn’t come here to eat — well, my original intention to work on a project in France may have been driven just a tad by the pâté, oysters, cheese, and wine. Now I’ve reached the stage of life when a sense of obligation to follow Michael Pollan’s advice, “Eat food, not too much, mostly plants,” nicely jibes with my eating inclinations. I like cooking and eating vegetables, meat weighs in my stomach too heavily, and ever since I cut far back on dairy, my annoying post-nasal drip has dried up. But I’ll eat anything that’s put in front of me and enjoy it. On my own, rabbit food just sits in me more comfortably. Before I arrived, I had ambivalent feelings about spending almost three months here in Foie Gras Central. Eating out is expensive, for one thing. And Mark Bittman’s recent column about the decline in restaurant cooking in France rings true to me, although I’ve recently had outstanding meals in Paris. Here in Bordeaux, not so much. And as one commentator in a previous post said (I paraphrase), even when it’s good, the range of food isn’t very broad. To my great surprise, Bordeaux has really good natural food stores and some quite good, relatively inexpensive southeast Asian restaurants. Apparently, organic food stores can be found in all French cities. I wasn’t much impressed by the Naturalia chain in Paris. Here, I have a very satisfying range of choices. At C’Bon, C’est Bio on the cours Victor Hugo, I found almond milk, good vegetables, decent wine, good mustard, smoked salmon, and lots of other things I regularly graze on. 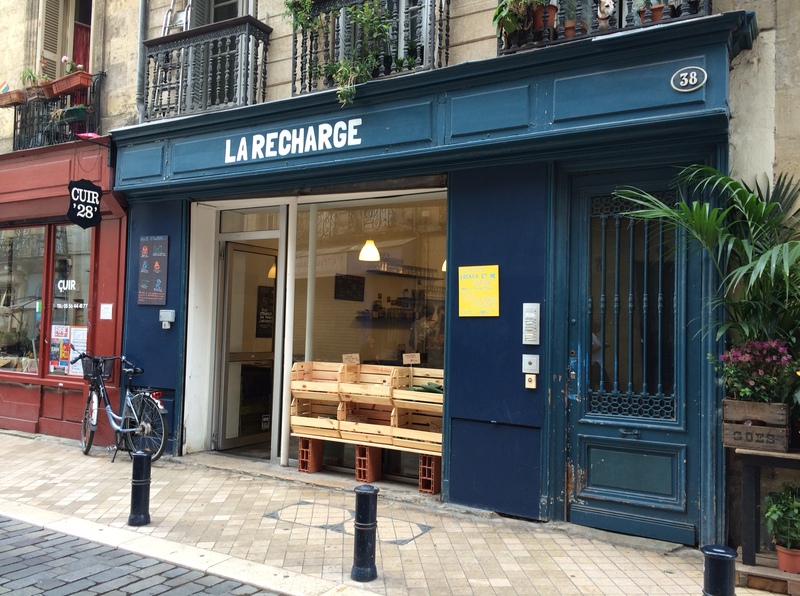 My sister sent me a link to an English-language newsletter about France with an article about Le Recharge, a very cool little store here that sells unpackaged food and cleaning products. Customers have to bring their own containers and bags. They specialize in cured meats and cheeses as well as butter from the Basque region, too. 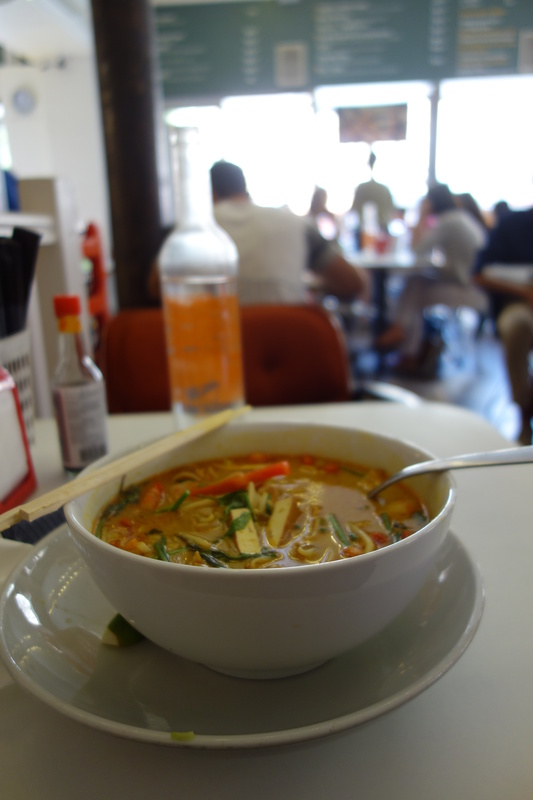 Across the street from Le Recharge is a decent Thai restaurant, but I prefer going around the corner to the place Fernand Lafargue, where Santosha, offers very tasty rice dishes and noodles soups with rich, distinctly not-vegetarian broth. Right next door is Yes Mum, Bordeaux’s only fish-and-chips shop. Vegetarians would have a pretty easy time eating in Bordeaux. Vegans would struggle. 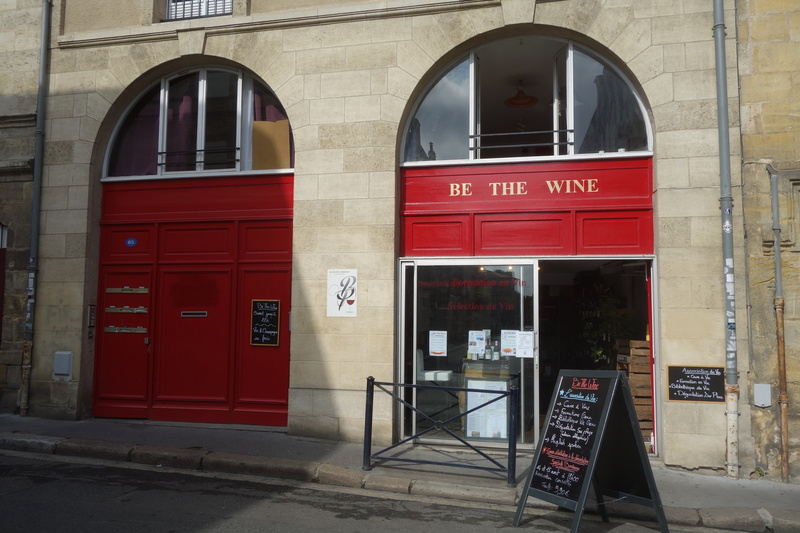 The Internet claims there is a vegan restaurant, Viva Las Vegans, but I haven’t noticed it on my daily walk down that street (The Bordelais seem to get a kick out of puns in English: on the same street as the mythical vegan restaurant is a wine bar called Wine More Time). 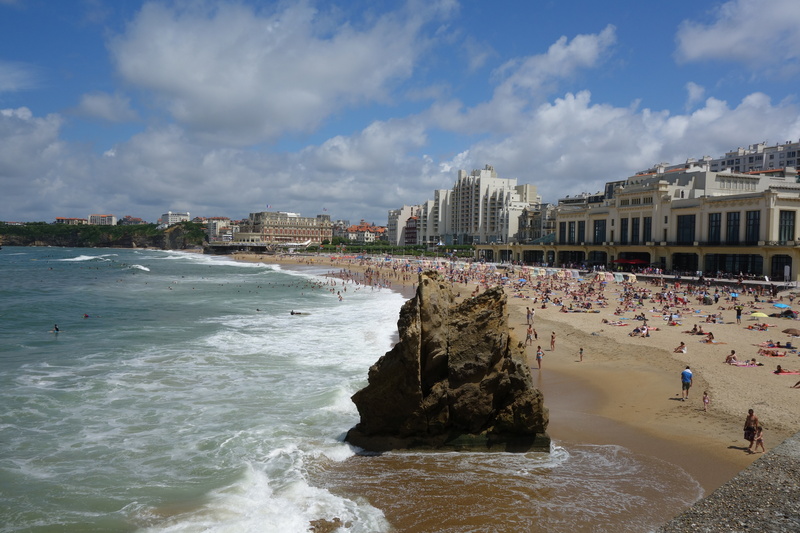 Our little band of beach warriors arrived by train in Biarritz, less than two hours from the Spanish frontier, in the middle of a thunder storm. The seven-year-old wanted to head to the beach regardless. The next morning, the skies still looked dodgy. We set out for the beach, only to find that swimming was forbidden that morning. That left us to the mercies of the town’s merchants. The town center has that slightly seedy, run-down appearance beach resorts tend to have. The houses in the surrounding residential neighborhoods looked like French adaptations of Swiss cottages. Outside the small covered food market were stalls of vendors selling antique linens, straw market baskets, rugs, and foutas (I’m coming home with four). We saw no Gucci, no Chanel, no Michael Kors, which was just fine with us. In fact, we had a hard time imagining Edwardian swells, including Edward VII himself, swanning around the place. The most interesting shops sold linen or spices, like piment d’espelette, the crushed chili pepper with a gentle that Thomas Keller made a point of promoting in his cookbooks. In the U.S., it costs fortune. Here, it’s pretty cheap. 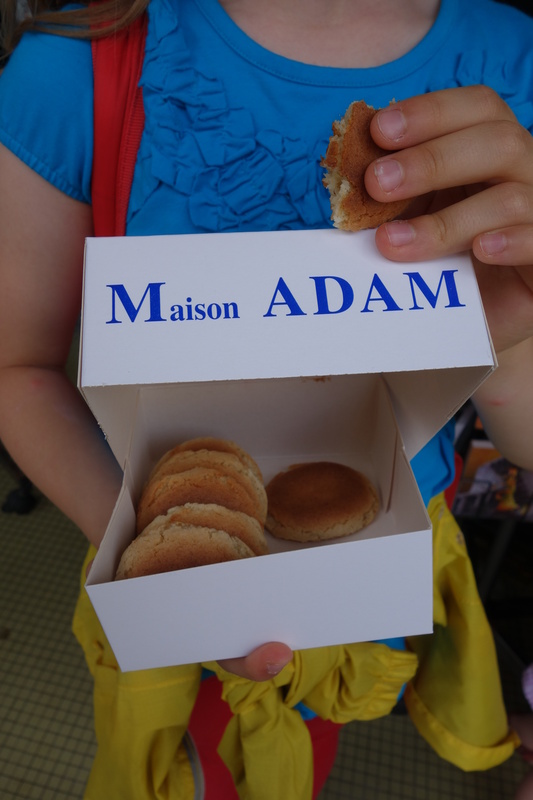 Our best find, however, was the shop that sells traditional macarons, Maison Adam, which I learned about earlier this month in Florence Fabricant’s NYT column here. The shop wasn’t hard to find: right in the center square. We couldn’t decide whether the chewy macarons — no ganache, no flavorings, just pure almonds baked dark brown in the center — were better than the box they came in. We bought a box of macarons (12 euros) AND two of us bought the tin boxes the macarons used to come in (5 euros). The weather on the final day was spectacularly serene and marine.